The other day I was sitting on the back deck with my daughter Keri talking about friendship. Keri is an amazing friend to others, so it’s no surprise that she has many friends. One of the qualities that I most admire about Keri is her ability to draw her friends out by asking them great questions. She loves to listen to the thoughts and feelings of others. While she’s been here, I’ve heard her check on many of her friends who suffered through hurricane Irma, and I’ve watched her send Voxer messages to friends in San Diego. She literally has friends all over the map! Jesus modeled the value of being a good friend. He walked and talked with Peter, James, and John, He spent time relaxing at the home of Mary, Martha, and Lazarus and He invited Himself over to Zacchaeus’s house for lunch. Others in the Bible also modeled friendship; one of my favorite stories in the New Testament is about some friends who worked together to help one of their friends who was paralyzed. The crowds who gathered to hear Jesus teaching in Capernaum were so large that not everyone could fit in the building where Jesus was teaching. The friends of the paralyzed man were desperate to get their friend to Jesus, so they dug a hole in the roof of the building where Jesus was teaching and lowered the man in front of Him. Jesus was impressed by the faithfulness of the friends and the faith of the man on the stretcher. He forgave his sins and healed the man (Mark 2:1-12). As I think about that story, I love the determination of the paralyzed man’s friends, don’t you? We might not be able to bring our friends on stretchers to Jesus, but we can determine to encourage and uplift them by asking them great questions and allowing them to process their feelings. Before you meet a friend for coffee or chat on the phone, think through the last time you talked. What were the issues they were facing at that time? Begin your conversation with specific questions about those situations. By putting in thought and effort, you are communicating that their friendship is precious to you. As a result, your conversation is richer and more meaningful for both your friend and you! What’s God teaching you lately? What’s the most challenging situation you are facing at work right now? If you could do the last few months over again, what would you do differently? What book have you read recently that you haven’t been able to put down? In what area of life are you feeling the most pressure or stress? What can I do to encourage you? Now it’s your turn. 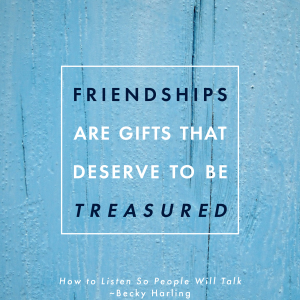 Leave a comment at www.beckyharling.com and tell us one great question a friend has asked you recently! Great questions Becky! I copied them down for reference. Thank you for this!! God bless you in your travels this week and in your service to Him. Wonderful! Thank you for the kind words, Alyssa! More great questions to add to the ones in your recent book! Great question a friend asked me recently: How are your son-in-law’s headaches? Great because he remembered my prayer request and has been praying! Love it and made me appreciate having this friend! Oh, I love that, Bonnie! It definitely brings a deeper appreciate for friends who pray for you & your family, doesn’t it? Thanks so much for sharing that!